One of this century’s greatest innovators hit the nail on the head with this famous quotation. It’s no wonder our developers applied the same philosophy when creating Pulse, the latest innovation from Pentana Solutions. Not only does it look sleek and simple – it’s sleek and simple to use. What is Pulse? 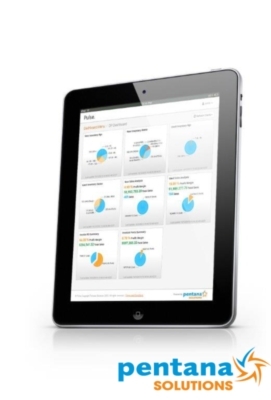 Pulse is a series of dashboards now available to give you a visual snapshot of your dealership(s). Once given a login, any ERAnet user will be able to take a simple look at what lies beneath the ERP. Without delving into traditional reporting, you’re now able to view your dealership in simplistic graphs and charts - with the option to drill down further into any area you choose. Without having to memorise executables or analyse lengthy reports, find out exactly what you need to know, in as little or as much detail needed, from your PC, tablet or mobile. Pulse is an ongoing initiative to give you clear insight as a manager to what exactly is going on. Using cutting edge technology, we’re able to give you the tools to address issues head on without having to dive into the depths of ERAnet. Pulse will save you critical time by deciphering the data for you – allowing you to make decisions and act faster. We’re putting you in the driver’s seat. Who can benefit from Pulse? The entire dealership. The amount of time saved and the amount of insights found will be dealership changing. Initially, two dashboards are available designed to suit the Dealer Principal and Financial Controller. Each dashboard is tailored to the user – a closer look at margins for the financial controller and a bigger picture view available to the dealer principal. Many more dashboards are in development, allowing for the opportunity to meet your needs. What else do you need to know? We’re all ears. We’ve worked hard to deliver this cutting edge platform, now let’s continue building it together. Your dealership can change the way it operates overnight. In a mobile, tablet world – view your dealership in a way that’s familiar to you. The new dashboards attract a burgeoning generation of managers that can now engage in the day to day analytics with ease.